National Rail Enquiries (NRE) provides a centralized online service for Train Operating Companies (TOCs) in the UK. The company was created by a number of train operators in 1996, when the industry went to a privatized approach. Initially, it operated primarily by phone, taking 62 million calls annually. Now the service has transitioned to an almost wholly online provision that makes it easier for travelers to figure out schedules and get travel advice. NRE is a private company owned by the TOCs. Approximately ₤250 million in ticket sales pass through NRE to the TOCs each year, and the digital channels get more than 1 million visits each weekday, with more than 5 million apps downloaded to iPads, iPhones, and Android devices. The NRE site provides a comprehensive online journey planning capability, including a pass-through to other sites to purchase tickets. As a company dedicated to helping make rail traffic easier for its customers, consistent service on its mobile site was imperative. Prior to signing on with Amazon Web Services (AWS), NRE operated two traditional data centers, each of which hosted more than 100 physical servers. To maintain consistent service, NRE maintained enough servers so that the site had the potential at all times to handle loads three to four times that of a normal day. The solution needed to be prepared for the kind of high-capacity loads that occur during rail service disruptions, such as heavy snows. NRE uses the service for online applications with complex, heavy usage calculation applications in the background, running database and high intensity calculation engines, to calculate routes and ticket options. The number of servers has been reduced from 200 to around 140 virtual instances. The solution includes Amazon EC2, Elastic Load Balancing, and Amazon RDS with Multi-AZ deployments. It runs Windows Server using SQL Server. The company uses Level 3 Communications to supplement the communication architecture, giving people the ability to connect via mobile phone and devices, in addition to connecting over the Internet or a VPN. The system is illustrated below. 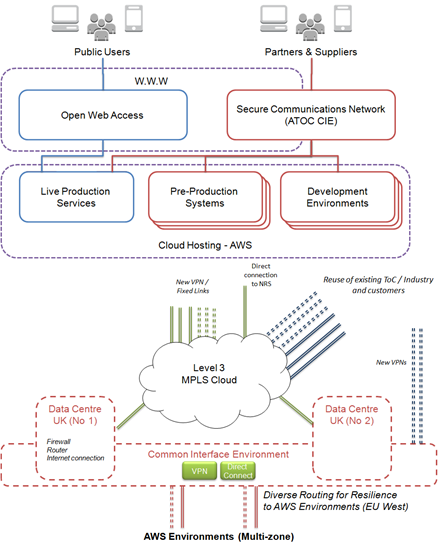 In Figure 1, the Common Interface Environment (CIE) controls all traffic and connectivity into the NRE systems from AWS Direct Connect, VPNs, and secure connections. Using AWS enabled NRE to save about 20 percent in infrastructure costs. The move has also helped NRE transition from a long-term CAPEX model to an OPEX model. Ashby says, “That allows that far greater flexibility and management of those costs.” The AWS pay-as-you-go model was also a benefit to the company, enabling the company to pay close attention to its costs to handle them as effectively as possible. NRE sees the AWS solution as very successful, particularly in terms of availability for its customers. On the day NRE launched the new system, the UK experienced its worst storm in 30 years. The load was 60 percent higher than the previous busiest day, but the service remained largely available, and site users were able to access the system throughout the storm. NRE’s adoption of the commoditized infrastructure has been so successful that other companies within the rail industry are looking at how they can adopt some of the same strategies. “By using AWS, we’ve been able to reduce infrastructure costs by 20 percent and gained the flexibility to react dynamically to demand,” Ashby says. To learn more about how AWS can help your cloud platform needs, visit The Benefits of Cloud Computing. For more information about how KCOM can help your company run on the AWS Cloud, see KCOM's listing in the AWS Partner Directory.